Personalized printed sunglasses classic – green is that lucky token, which will get you noticed in this summer. This green and summer friendly sunglass offers protection from UV rays and looks cool on everyone. Environment friendly awareness messages can be easily conveyed through this sunglass. This sunglass makes a great gifting choice during tradeshows, business conferences, parties, summer camps, summer festivals, pool side parties and on many more joyous occasions. We process huge orders of this sunglass for marketers who are targeting youth and wish to win their appreciation. Great value discounts can be availed on bulk orders. 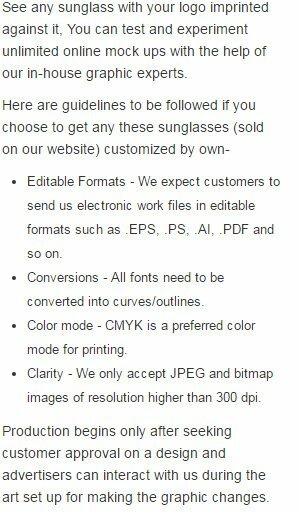 Request for a quote to know more about discounts that are offered on customized printed sunglasses classic – green. Features – Adult-sized sunglasses. Green plastic frame with tinted lenses. Offers UV400 protection.